Antiochus XII ruled the Seleucid Empire from 87-84 BC. He was the fifth son of Antiochus VIII Grypus and Tryphaena to take up the diadem. 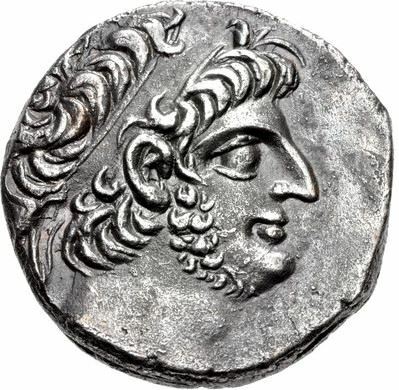 He succeeded his brother Demetrius III Eucaerus as separatist ruler of the southern parts of the last remaining Seleucid realms, basically Damascus and its surroundings. Antiochus initially gained support from Ptolemaic forces and was the last Seleucid ruler of any military reputation, even if it was on a local scale. He made several raids into the territories of the Jewish Hasmonean kings, and tried to check the rise of the Nabataean Arabs. The Battle of Cana against the latter turned out to be initially successful, until the young king was caught in a melee and killed by an Arab soldier. Upon his death, the Syrian army fled and mostly perished in the desert.